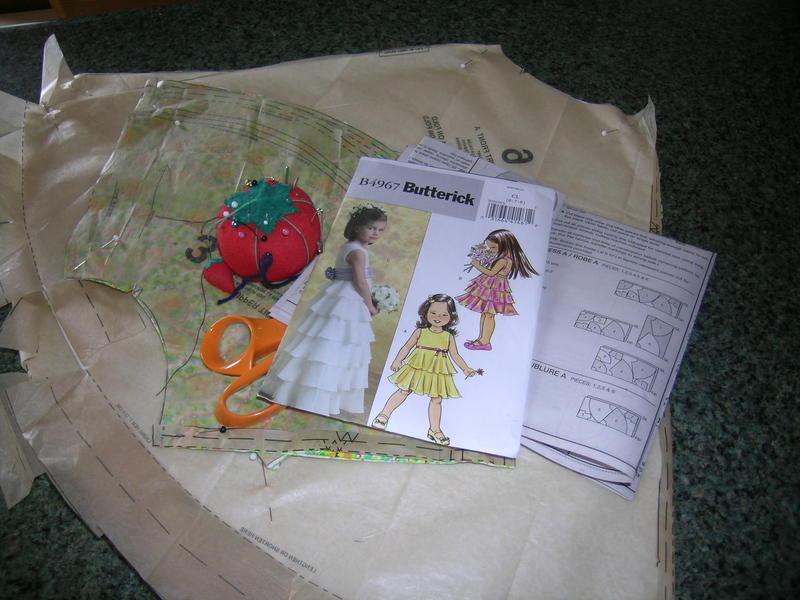 As the wedding gets closer (Aug) it is time to do a practice run on making the flowergirl dress. We bought some fun summer fabric to experiment with the pattern (B4967 Butterick) hoping that it would fit and our flowergirl would have a fun dress for the summer. We measured our little darling and her measurements dictated that we should use size 4 for one of her measurements and a size 7 for another measurement. Hum, what should one do. I chose size 6 . The pattern was very easy to follow and took me a couple of days leisurely working on it and doing my other daily work. With the dress finished our challenge was to see if it fit. You see, our little darling lives 3 hours away. Last week was our lucky week. We had a reason and ride to travel 2 hours with only an extra hour to reach our destination so off we went. It was a fun day and the dress fit perfectly. After the fitting we excitedly went to the fabric store and purchased the actual fabric. Watch for the progress on the “real” flowergirl dress.